Director Justin Kurzel reunites his Macbeth cast of Michael Fassbender and Marion Cotillard for this disjointed sci-fi action yarn based on a video game – which has never been a phrase to fill anyone with confidence. 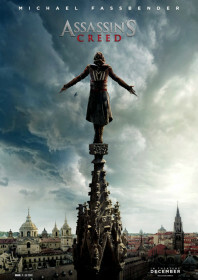 The scenes that feel most like a computer game are actually the best parts of the film; namely the free-running flashback fight sequences across 15th century Spanish rooftops. These are all atmospheric, slick and punchy. They tell of a dedicated band of ninja-like assassins who seek to restore order in Spain at the height of the Inquisition, who covet the so-called sacred ‘Apple of Eden’ which seems to be some kind of underwhelming, metallic, baseball-shaped device which can control free will, somehow. (It’s never quite explained.) Flash-forward to 2016 and convicted murderer Fassbender wakes up in an ethereal, new-age rehabilitation centre. The top-secret base is led by father and daughter duo Couillard and Jeremy Irons, who lead on research into offenders in a bid to put an end to violence. Their billion-dollar experimental programme is backed by Charlotte Rampling and her wealthy, modern-day Knights Templar as a convoluted way of finding the Apple thing. Fassbender is discovered to be a direct descendant of a leading Assassin’s Creed member, so he is strapped into a memory recall device to embody a version of himself in 15th century Spain fighting the Templar Order in a bid to discover the Apple’s whereabouts. The premise completely falls apart under any sort of logic (why is Irons so publicly revered if his criminology research is covert? Why is there so many other people imprisoned at the laboratory when only Fassbender has what they need?). The modern-day sci-fi scenes conjure up Total Recall or Source Code – only not nearly as much fun – and the clandestine religious paranoia resembles something from a Dan Brown novel. Then there’s the swords and sandals stuff, performed with great gusto by Fassbender and Ariane Labed, which is the only element of the film which saves it from being a total snooze-fest.